A solid brass body with an 8mm shackle and a 4-digit code makes this a secure and yet affordable security option. It is also designed with a resettable mechanism allowing you to choose our own combination using a special security key preventing anyone from changing the combination at a later stage. The body is satin chrome plated to make it more attractive than bare brass but also allows the padlock a little more environmental protection. 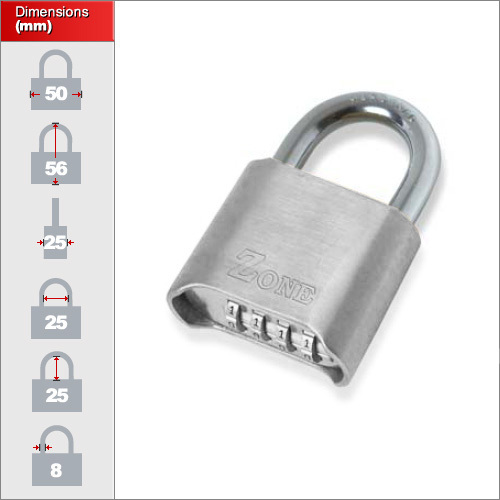 On our website we have one size of popular large brass combination padlock but we hold numerous different sizes and codes. Please contact us for specific models or sizes. 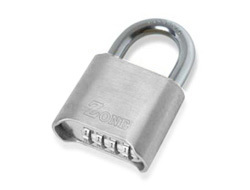 This padlock is ideal for locking up hardware, tools, gates, doors and various storage. A precision 4 digit code offers up to 10,000 variations and prevails where a smaller combination padlock can be cracked within about 20 minutes. Please note that this is not a weatherproof lock and although it would be ok for occasional outdoor use, you should look at one of our weatherproof combination padlocks for continual use outdoors.